This blog presents some of the sources encountered, thoughts considered, and people met of a historian working along various frontiers and borders. After suffering defeat in the South African War, between 1902 and 1903, Boer exiles from southern Africa (related to my previous post) chose to settle 60 miles southeast of Chihuahua City on a stretch of land made fertile by irrigation agriculture. The Boers had considered lands first in Sonora, among the Yaqui Indians, but selected fields in Chihuahua (Mexico) that offered an easier connection to U.S. markets to the north by railroad. The details of this colony -- what it produced, how long it lasted, and where it went -- appear in my book's Chapter 4. In researching this history, while doing archival work, I went to the location of the colony to track down descendants still living in the region. Along the way I learned an important difference between understanding history and proving it. C) A and B, but mostly B. Despite the long odds, and accompanied by a Chihuahua friend, I managed to make contact with Don Pablo Hoffmann, whose grandfather purchased the lands from the Boers (though Don Pablo, himself, knew nothing of the lands' southern African connection). 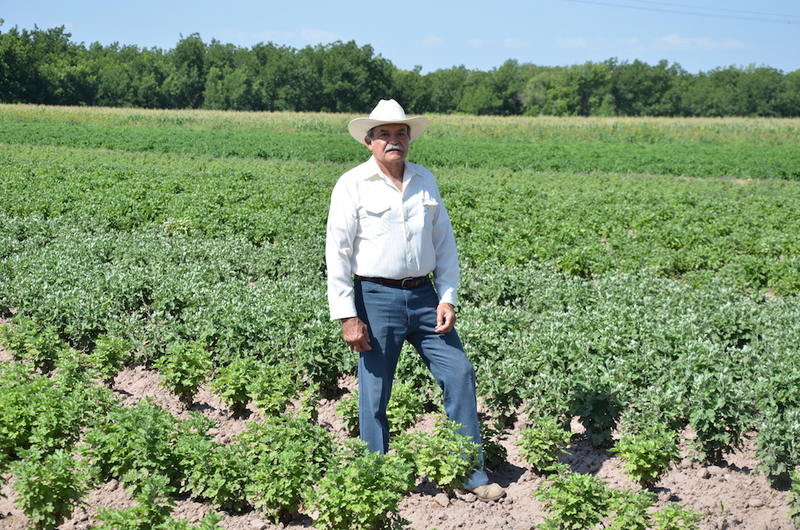 Don Pablo Hoffmann in his fields, near Meoqui, Chihuahua. June 2014. On two separate occasions, Don Pablo welcomed me into his home and shared his knowledge of the family lands. I must admit, when he did not know of the connection to the Boers, while not entirely surprising, it did raise a number of questions in my mind. Was I absolutely sure I had the right location of the Boer colony? What proof did I have that it was once on these exact lands? Don Pablo shared a number of documents/items with me, including an original label for peaches that his ancestors once canned and marketed throughout the state and region. After 1905, German colonists in the early twentieth century canned peaches and other products for sale in Mexican and U.S. markets. The Hacienda de Humboldt got its name as an homage to the German explorer, Alexander von Humboldt, who had traveled through the region a hundred years earlier (ca. 1804). I left with a deeper appreciation for the region's rich history, but a question lingered for several days: where was the proof connecting the Hacienda de Humboldt with the previous Boer colonists? Don Pablo's certainty shook my faith in how I understood the past. What did I have that could prove to him that, without question, his lands had a connection to Boers, and that I was not a random gringo making false claims for personal advancement (a history not unfamiliar to the region)? For the first time, I had what felt to be the most skeptical audience imaginable: a generous and cordial gentleman, sharing coffee with me in his home, trying to weigh whether my textual proof would convince him that he did not know an entirely hidden part of his lands' history. More than any other readers of my future work, he had a vested interest. As it turned out, I would find proof in the ICHICULT archives in Chihuahua and in online newspaper repositories over the next few days. The lightening bolt struck in the lead paragraph of an article appearing in the Mexican Herald, an English language paper based in Mexico City, in December 1906. Mexican Herald, December 2, 1906. 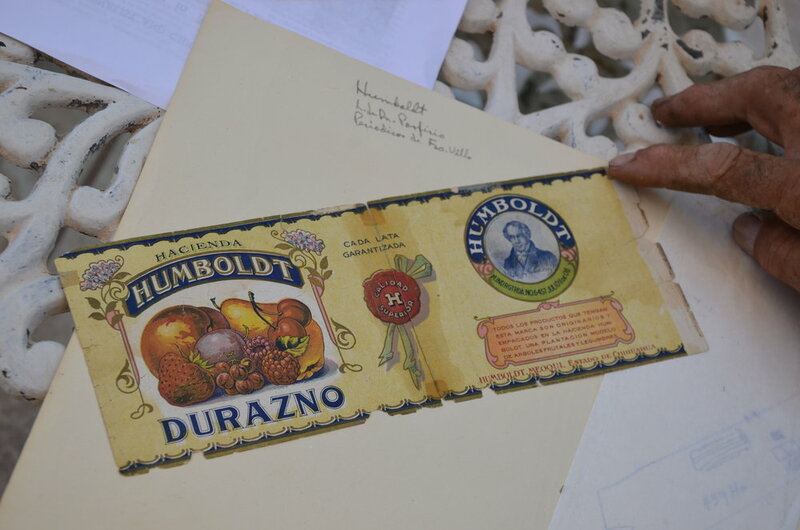 With this, I had proven the Hacienda de Humboldt's history and shared with Don Pablo his strange connection to a Boer past. As I left the region for the last time, outside of Meoqui, I saw the workers tending the fields, realizing that the "strange" history is only so because of categories we place on people: nation, gender, race, and class. The longer history of human hands, fertile earth, and agriculture smooths over these rough patches of interest, and in this way I felt as if I were viewing a sight common to Don Pablo's time, to his grandfather's (and Boers'), and to Alexander von Humboldt's. Workers in a field near Meoqui, Chihuahua. July 2014.